The Jay Lite Is A Super Lightweight Supportive Cushion. The Jay Lite is a super lightweight cushion, particularly useful for use with lightweight aluminium and titanium chairs. As it has a lightweight foam base, it provides structure and support without extra weight. Using 3DX spacer fabric, it enables heat and moisture to flow easily through the material - essential to minimizing skin integrity issues. The pelvic loading area is shaped and sized to distribute pressure under the pelvis, but without placing excessive strain. And last but not least, the Jay Lite cushion looks great - with its raised rubber name tag, rubber non stick bottom and custom carrying handle! Heat and moisture dissipation are critical to minimise skin integrity issues (heat and moisture are known risk factors for skin breakdown). The cushion cover uses 3DX spacer fabric that allows heat and moisture to flow easily through the material, without losing ventilation even when compressed. Airflow is increased through the cushion by the punched base and highly porous foam inserts, allowing air to circulate and moisture to be wicked away. Some seat wells tend to slope too quickly, placing tension on the tissue between the bony prominences of the pelvis and those of the hips and thighs. They may also slope too gradually, failing to reduce weight on the (at risk) bony prominences of the pelvis. With JAY LITE, the OptiWell™ pelvic loading area is optimally shaped and sized to evenly distribute pressure under the pelvis, without placing excessive strain on the tissue between the pelvis, hips and thighs. Ischial cut-outs (cut-outs under the bony prominences of the pelvis – ischial tuberosities) and scooped reticulated foam inserts also significantly reduce reaction forces that are caused by foam compression. Weighing a mere 780 grams, the JAY LITE is the perfect complement to ultra lightweight aluminium and titanium chairs, such as the new Quickie Helium. Its lightweight foam base, inserts and fabric provide structure and support without extra weight. The pre-contoured angle of the OptiWell™ wall matches the angle of the pelvic bone structure, resulting in both lateral and forward / rearward stability due to a more evenly distributed load. In addition, firmness layering of the foam base provides optimal comfort without sacrificing stability. The soft EVA foam provides comfort whilst the firm Oletex foam offers positioning and support. Also available is a positioning version that includes two adductors and one abductor, helping the user to maintain appropriate postural stability. I replaced my Jay-2 cushion with the Jay-Lite in Nov 2010 and have been very pleased with it. The Jay-2 plastic covered fluid pad did generate a lot of heat under your backside and this has been eliminated with the Jay-Lite. The firmness of seating position is just as good as the Jay-2 too, so you'll notice no difference in your posture positioning. Of course, you might wish to have your physiotherapist's advice before purchasing, especially if you have sensitive skin. Luckily, I have not and have not had any skin related issues. The lightness of the cushion is a major advantage over the Jay-2. Is so light it would blow away in a strong wind if you dropped it getting in to the car. I use the Velcro strip that is supplied on it to secure it to the Kuschall Ultra-Lite chair I use. The cushion is a must for those with little strength to lift it in & out of a car. The air-vents through its seat base do keep you much cooler as does the special cushion cover that comes with it. 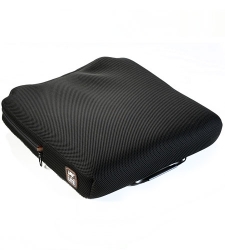 The cover is specifically made for this cushion and is an additional expense should you need to have a regular spare. It's good, comfortable, but I needed the positioning version and it wasn't clear that if I needed leg wells this was the one to order. Too late as I needed a cushion so started using it and can't get a replacement but be aware of this as there isn't a good explanation on the site.